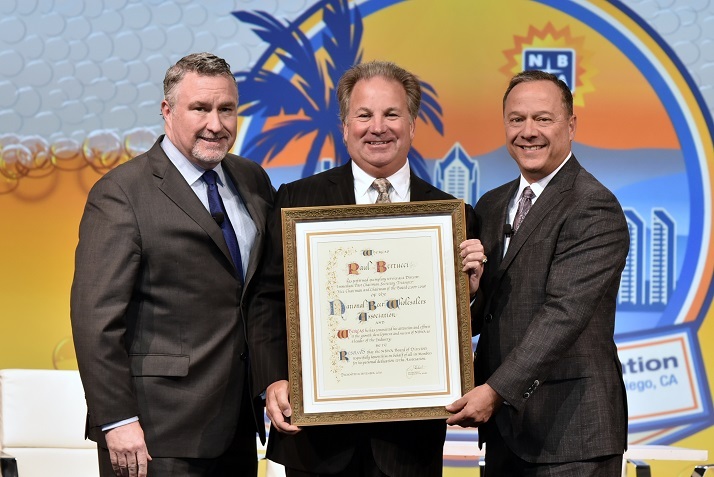 San Diego, Calif. – The National Beer Wholesalers Association (NBWA) celebrated the final day of its 81st Annual Convention in San Diego, Calif. Tuesday with the passing of the Chairman’s gavel to Michael Schilleci, president of Supreme Beverage Company. NBWA also honored several leading distributors and industry leaders with the group’s most prestigious awards. Jim Matesich will remain on the Board in the position of Immediate Past Chairman and take the place of Paul Bertucci who served as Chairman for the 2016-2017 Board year. As a part of the leadership transition, Purser and Matesich presented Bertucci with the Chairman’s Scroll to thank him for his service the organization. Addressing the Convention, Schilleci prioritized three major initiatives for NBWA under his stewardship: to grow and protect the beer distribution industry; to keep a strong focus on the Beer Growth Initiative (BGI) in order to strengthen overall beer category health; and to continue validating the beer industry’s independent distribution model. 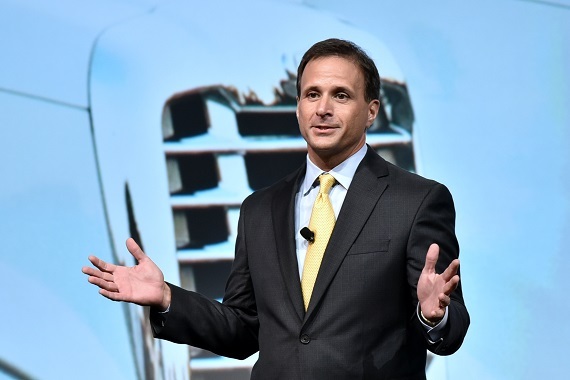 Schilleci noted that he believes strategic advocacy is the strongest way to highlight the industry’s strengths in local communities and with policymakers. Following Schilleci’s remarks, he and Purser presented several awards to distributor members, including the Public Affairs Award, the Whitney Littlefield Award, and the Kenny Kerr PAC Award. Marianne Origlio of Pennsylvania-based Origlio Beverage was awarded the Public Affairs Award for her work to advance the beer industry through two major publications: Heady Times and Draught Line. The Standard Sales Company based in Texas, Mississippi, and Kentucky won the Whitney Littlefield Award for its outstanding efforts to encourage employees to support NBWA through its PAC. Finally, the late Scott DeMartine of Columbia Distributing in Washington State was the recipient of NBWA’s Kenny Kerr PAC Award for his extraordinary spirit and passion for building relationships, promoting the industry and increasing overall support for the PAC. “Distributors’ enthusiasm for and devotion to the growth and livelihood of the beer industry is unmatched, and we could not be prouder of the men and women we represent,” Purser said. The Convention continued with a panel discussion featuring D.G. 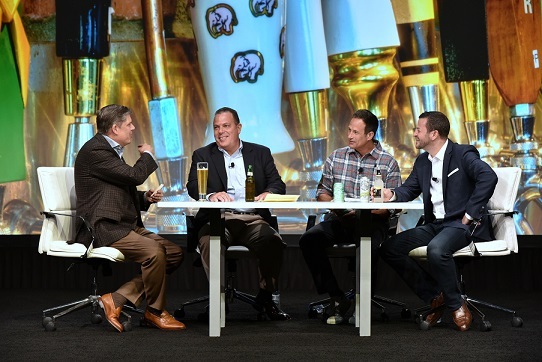 Yuengling & Sons Inc. COO Dave Casinelli, Dogfish Head Co-Founder Sam Calagione, and Mike’s Hard Lemonade President Phil Rosse. The panel, moderated by NBWA Vice Chairman Brian Gelner, discussed brewery responses to the downturn in beer consumption. Through the conversation, themes of innovation, embracing successful segments and producing quality products emerged. 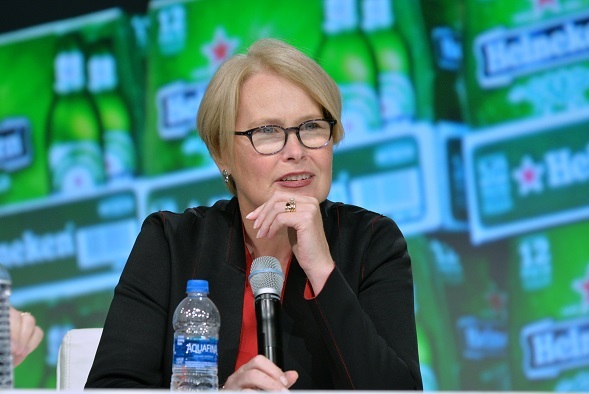 Following the panel, Heineken CEO Maggie Timoney joined Purser on stage to talk about the state of the beer industry and what people can expect during her tenure. Timoney stressed the need for fresh thinking and hard work to return to growth and recover market share. Heineken USA named Timoney CEO in June. NBWA also recognized three outstanding brewers for going above and beyond in their collaborative efforts with their distribution partners. Newburyport Brewing of Newburyport, Mass. won the NBWA Brewer Partner Gold Award, Summit Brewing Company of St. Paul, Minn., received the NBWA Brewer Partner Silver Award, and Mother Earth Brewing of Vista, Calif. and Nampa, Idaho, received the NBWA Brewer Partner Bronze Award. The day ended with the inspirational story of Paralympian and ESPN personality Victoria Arlen who grew up as an energetic child until she was struck by a mysterious illness. Arlen found herself bed-ridden and unable to communicate, spending years in a vegetative state. Then, one day, Arlen suddenly began to wake up. Her story turns life’s challenges into an unending source of fuel leading to extraordinary accomplishments. She committed her life to learning to walk – and dance – again. Recently, Arlen achieved a new milestone as a contestant on Dancing with the Stars.